After one of the worst pre-Christmas Decembers for the market in recent memory, U.S. equity markets somewhat miraculously eked out a 1.3% gain for the S&P 500 during the much-anticipated Santa Claus rally period. According to noted technical analyst Tom McClellan, “The Santa Claus rally consists of the last 5 trading days of the year plus the first two of the next year.” Based on his research, this period has been positive for the U.S. equity market in 78% of the years since 1928 and was once again for 2018–2019. Much improved market sentiment, aided greatly by comments from Fed Chair Powell on January 10, fueled an impressive rally for the S&P 500 of 13.5% off the low of Dec. 24, 2018, in just 17 trading days. What will the rest of 2019 bring? The Fed will pause to start 2019: With economic growth set to slow and with financial conditions having tightened, the Federal Reserve will likely pause its rate hikes to start 2019 in order to stabilize markets. Stocks will rebound in response to a Fed pause and surpass their highs: The combination of a Fed pause, decent earnings growth, and a modest recovery in price/earnings multiples will likely push the S&P 500 Index to new highs. A Fed pause will allow excesses to become more pronounced: A more dovish Fed will encourage more debt accumulation and allow excessive leverage to become more pronounced. A historically tight labor market will ultimately call for more Fed hikes: Even as the Fed slows the pace of rate hikes, the labor market continues to be strong. With job gains likely to further exceed labor force growth, unemployment is likely to fall even lower in 2019. We expect the Fed will raise rates twice in 2019 to try to cool the labor market. 10-year Treasury yields will rebound as the outlook improves: Given the strong relationship between the 10-year Treasury yield and the market pricing of the terminal fed funds rate, our forecast of two Fed rate hikes in 2019 suggests the 10-year Treasury yield will rebound to 3.15 percent. 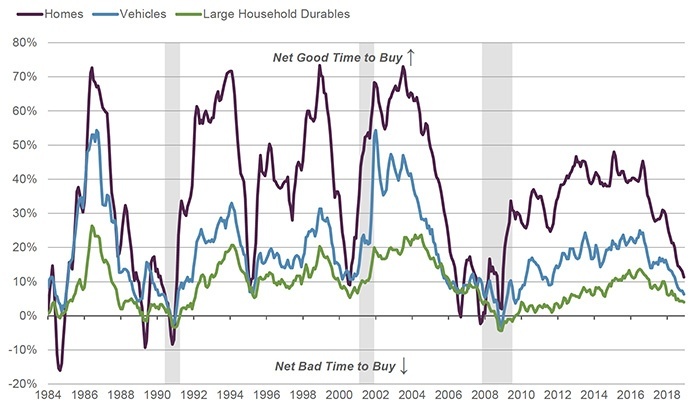 U.S. economic growth will cool as rising rates weigh on consumption: Business capital expenditures and consumption of homes, autos, and appliances will all feel the effects of rising rates in 2019. We see a broad-based slowdown in real GDP growth to below 2 percent year over year by the fourth quarter of 2019. Note: Data as of 10.31.2018. Shaded areas represent periods of recession. 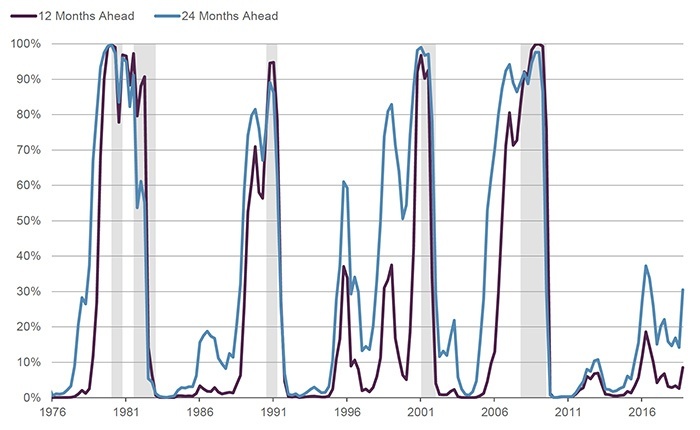 Recession will be avoided in 2019, but watch out for 2020: Our recession model is signaling relatively low recession risk in the next 12 months, however we continue to expect a recession will begin in 2020, as a historically tight labor market forces further tightening by the Fed, pushing the overleveraged corporate sector into a downturn. Note: Data as of 9.30.2018. Q4 2018 recession probability is based on Guggenheim forecast of model inputs. Shaded areas represent periods of recession. Credit spreads will widen as recession fears mount: With a recession likely to begin in 2020, we expect that spreads will be wider by the end of 2019. The most pronounced widening would occur in the high-yield sector. The U.S. corporate default rate will rise: Given significantly higher borrowing costs, a seizing up in the flow of credit to leveraged borrowers, and a likely tightening of bank lending standards, we expect the high-yield default rate to climb in 2019. U.S. political battles will undermine confidence and increase risk premia: The U.S. political climate has become more polarized under President Trump than at any point in the post-war period, which will result in legislative gridlock. This can be seen in the spread between the president’s approval rating with his own party relative to opposition party voters. Battles over the budget, trade issues, the debt ceiling, and investigations into the Trump administration will undermine confidence and weigh on the markets. Note: Data as of 12.22.2018. 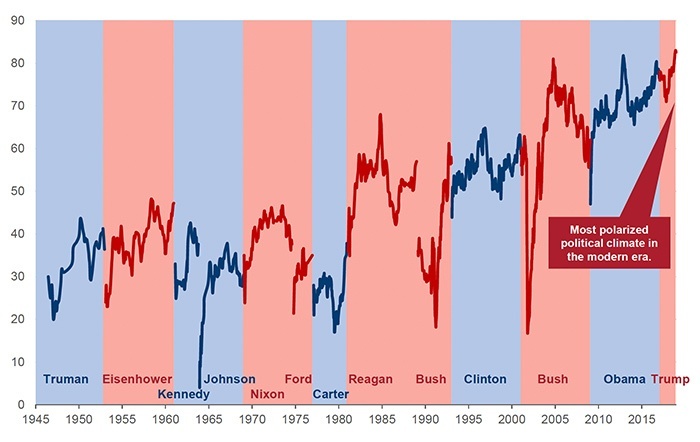 Blue shading denotes Democratic presidents; red shading denotes Republican presidents.